Back in 1776, the founding fathers signed the Declaration of Independence to ensure that all Americans could live in a land of opportunity. Millions have fought and died to protect the fundamental freedoms that many of us take for granted. But a retired Army Staff Sergeant named Hank Robinson decided to pay tribute to the fallen heroes of the modern era when he engraved the entire aluminum body of a 2016 Ford F-150 show truck called Freedom Blues. Over a 10 year span, Hank Robinson was deployed in the war zones of Afghanistan and Iraq. When he retired in 2011, he found that transitioning back into civilian life wasn't as simple as most people would think. One day you're fighting insurgents on a rooftop. And the next, you're fighting for a parking spot outside a Wendy's. Turning off Survival Mode isn't easy for many veterans unless they can figure out a way to channel their focus into the present and future. This is why Hank decided to use the G.I. Bill to attend welding school, where he wound up trying his hand at metal engraving. He enjoyed it so much that he began engraving one-of-a-kind gifts for family and friends, and eventually started Hanro Studios out of his garage. The Freedom Blues Ford F-150 was intended to bring a message of hope to veterans that were struggling with the same issue. 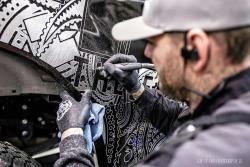 It was prominently featured at the 2016 SEMA Show in Las Vegas, and Hank even did live engraving sessions during the show to complete the artwork. The truck was then displayed at over a dozen shows, including the Goodguys All-American Sunday in Scottsdale, and it led a procession of bikes on a Ride for the Fallen. 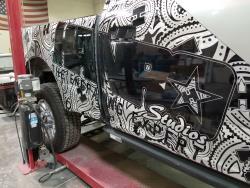 After an extensive tour on the show circuit, the Hanro Studios Freedom Blues F-150 was featured on the cover of Truckin’ magazine, and it garnered the attention of West Coast Customs owner Ryan Friedlinghaus, who invited Hank out to LA to do some engraving work on a Cadillac they were building for legendary rock star Kid Rock. Turns out the Coupe DeVille was originally owned by country music legend Waylon Jennings. WCC and Kid Rock wanted to rebuild the car as a tribute to Jennings, and the custom engraving work turned out to be the perfect finishing touch. As far as the Freedom Blues show truck, it will be auctioned off in January 2018, at the famous Barrett Jackson Scottsdale auction. A portion of the proceeds will go to a fantastic organization called The Warrior Built Foundation, which provides veterans with the tools and training they need to explore a new life in the automotive and fabrication world. 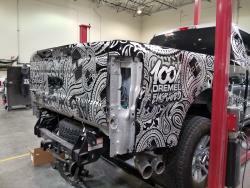 And to replace his now-famous show truck, Hank is building an all-new truck for the 2017 SEMA Show called “Aluminati”. The Hanro Studios Aluminati show truck is based on a 2017 Ford F-250 Super Duty, and the name was chosen from several hundred social media submissions (it’s a play on words since the 2017 Ford Super Duty now has an all aluminum body). Hank purchased both show trucks himself, so this one will become his personal “mobile engraving station” once the car show season is over. In the back, it will have an onboard air, vacuum, and power supply system that was designed and built by Truck Vault. The overall concept and artwork were created by Robinson, and ECD Customs. Chris Payne from Truck Guru created the renderings and is acting as project manager for the build. Since this will eventually be Robinson’s “work truck”, the interior will be all about luxury. Scottsdale Upholstery is installing black Roadwire leather seats, and Roadwire even provided enough extra leather to wrap the doors, dash, and console. 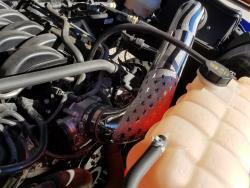 On the outside, Troy Buck of FX Autobody laid down the slick black/silver color scheme. And Hank will spend an estimated 1,100 hours with his Dremel tool, carving multiple Hanro Studios themed designs into the body. We at K&N would like to thank Mrs. Robinson for helping her husband’s vision become reality. 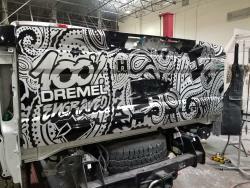 If you would like to check out the result of all their hard work, stop by the Truck Hero booth (# 61040) at the 2017 SEMA Show in Las Vegas.